Our good friend Leif Holmberg (Sweden) with whom we regularly correspond on identification of of car photos is currently helping the Torsakers Photohistoric Society to identify cars and motorcycles. Came across a number of photos of a little known German car, the Windhoff. 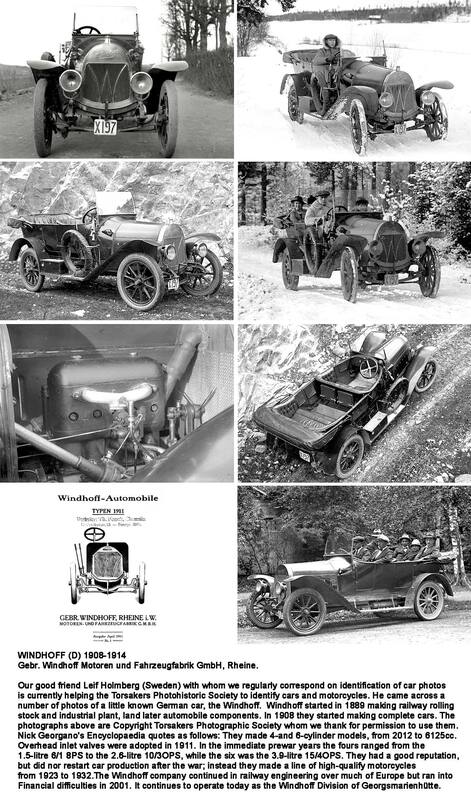 Windhoff started in 1889 making railway rolling stock and industrial plant, and later automobile components. In 1908 they started making complete cars. Not very much about them on the internet. Click...more. 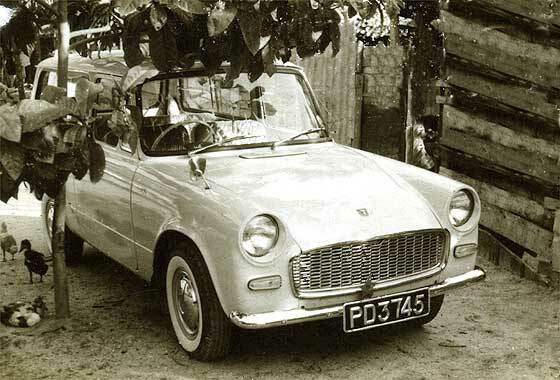 Photo submitted by Gerald Hawkins of the Brundall Archive website (UK) for whom we have identified a number of vehicles, saying this one is from the Archives but not on the website. They believe it is connected with the Ffiske Family (Boulton Paul). -- Registration seems AK1100 which is Bradford CBC Yorkshire, late 1908. It has a bulkhead radiator which limits makes. 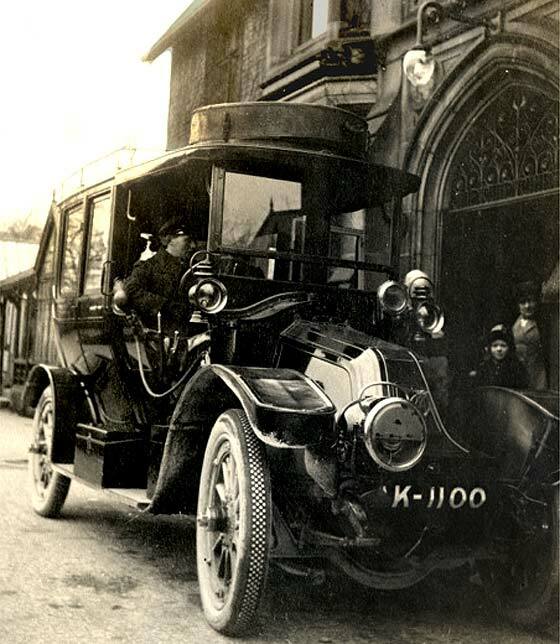 The vehicle is a top-of-the-range cca 1908 Renault 20'30 Limousine photographed post 1911 as the AA badge has wings. Fascinating photo received from Laurie Roberts (USA) believed of Grandfather Frederick Pinborough (far right) with mother & her sisters Cracknell. Taken Yarmouth about 8 4 11.-- Great Yarmouth on the coast of Norfolk (UK) was a famous interwar holiday resort for the masses. Registration is Jan 1911 London CC. The car is a cca 1908 Unic 12'14 Taxi. Billbord has 'hippodrome' so location is in front of the Yarmouth Hippodrome close to seafront, which still continues to operate today. Number of interesting photos sent to us by Andrew Kostin from Moscow (Russia) who is a collector of old photos and who has a website devoted to this subject at http://antique-photos.com/en/. Can we identify this nice photo from Argentina? -- Quite small photo so difficult to be absolutely sure. The car in the middle is Italian. Radiator is similar to FIAT but seems to have an oval white badge with darker middle, and gas lights. So probably cca 19123 Lancia Delta Torpedo, short chassis. Fascinating photo received from Eoin Shanahan (Eire) described by its owner as a Briscoe 20HP touring car "new" in 1916, but was registered to another owner 1915.-- Hidden front, but hubs are Briscoe! Briscoe introduced the Model B at 1914 New York Autoshow. This was the 'cyclops' with single headlamp, illegal in some states. Car in photo has hinges so post 1914, cyclops so pre 1916, so has to be a cca 1915 Briscoe Model B Deluxe Touring, 15 or 33HP. Wire wheels were optional. Fascinating photo received from Laurie R (USA) found in grandmother's belongings. On the back is handwritten "14th July 1926 Just leaving Yarmouth for Newmarket." 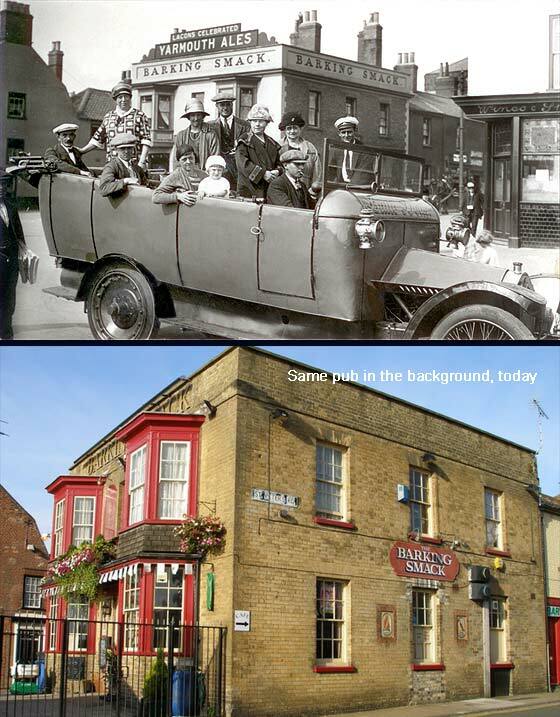 It was shot by "Jackson's Faces" Great Yarmouth.-- Great Yarmouth on the coast of Norfolk (UK) was a famous interwar holiday resort for the masses. 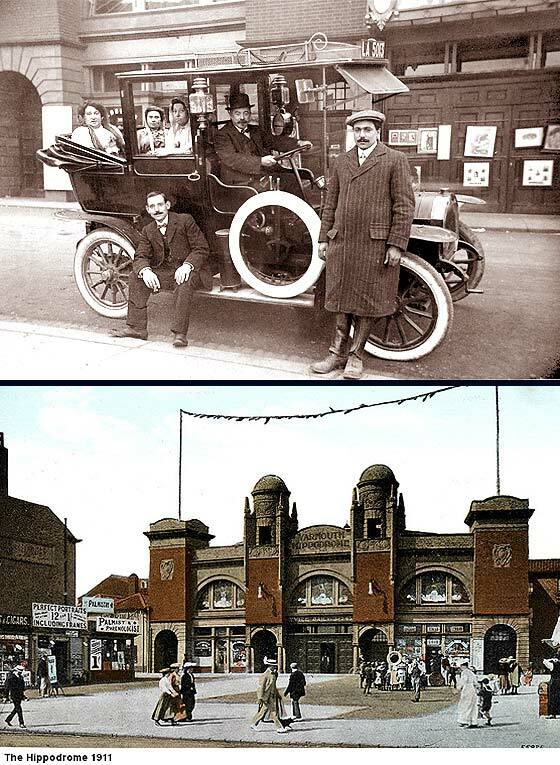 'Jackson's Faces' was a photographic business providing visitors with pictures of their stay. The vehicle is a cca 1918 Crossley Charabanc, - interesting solid rear tyre. Number of interesting photos sent to us by Andrew Kostin from Moscow (Russia) who is a collector of old photos and who has a website devoted to this subject at http://antique-photos.com/en/. Can we identify this photo from Argentina ? 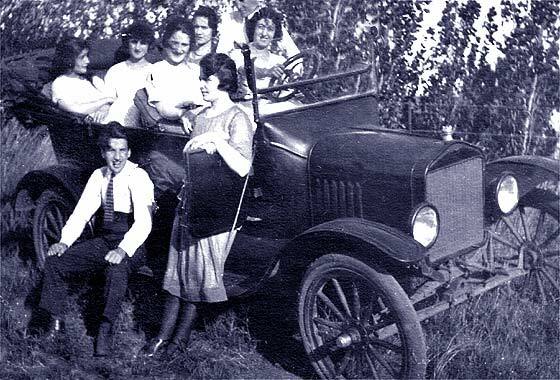 -- A group posing in a very popular American car made in Buenos Aires. 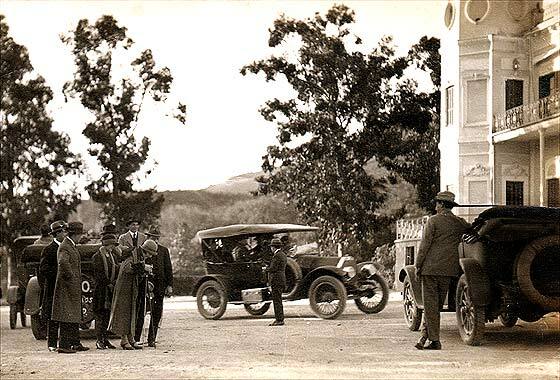 Ford Argentina was founded in 1913 and assembled Model Ts from 'complete knockdown kits' made in the USA. From the wheels and windscreen, this is cca 1919 Model T Ford Touring. 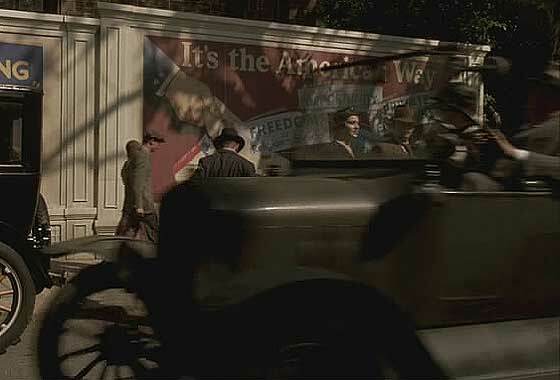 Cinema screen grab from an American period crime dramea television series "The Broadwalk Empire" made 2010-14 where the cars are being investigated by IMCDB. Film about Atlantic City at the dawn of prohibition where the bent town treasurer runs things. -- Even though the picture is of a moving car it is possible to note Model T features. Just a hint of the transverse front spring,detachable wheels, the six louvre bonnet, upturned steering wheel, cca 1919 Ford Model T Touring. Number of interesting photos sent to us by Andrew Kostin from Moscow (Russia) who is a collector of old photos and who has a website devoted to this subject at http://antique-photos.com/en/. Can we identify this photo from Argentina ? -- Jovially posed photos on a farm of rather derilict vehicle which from the muddy tyres seems to be still in use at the time. The car has a transverse spring so easily identifiable. Study of details like wheels and radiator date it cca 1920 Ford Model T Touring. Number of interesting photos sent to us by Andrew Kostin from Moscow (Russia) who is a collector of old photos and who has a website devoted to this subject at http://antique-photos.com/en/. Can we identify these photos from the US? 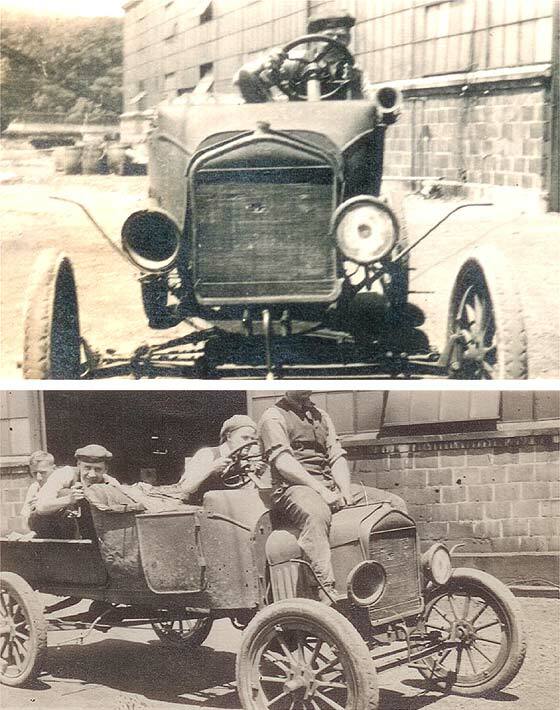 -- Couple of jovially posed photos on a farm of a group of lads pretending to be racing at Indianapolis. The car has a transverse spring so easily identifiable. Study of other details such as wheels and radiator date it accurately as cca 1920 Ford Model T Pickup. Number of interesting photos sent to us by Andrew Kostin from Moscow (Russia) who is a collector of old photos and who has a website devoted to this subject at http://antique-photos.com/en/. 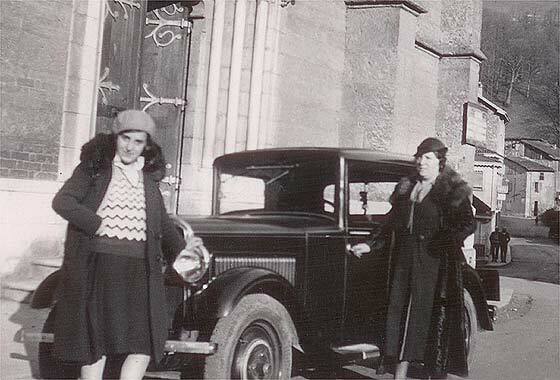 Can we identify this photo from Uruguay ? 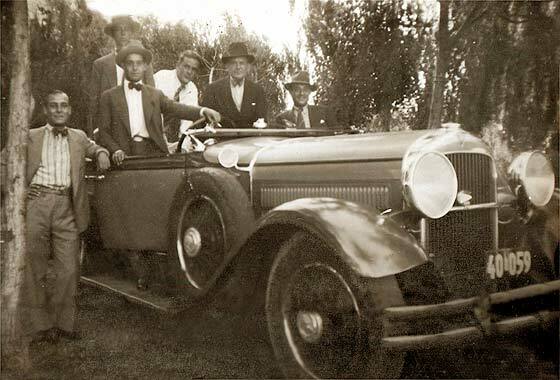 -- A group posing by a very popular American car possibly made in neigbouring Argentina. From the long multilouvre bonnet this is a cca 1926 Model T Ford Touring which was losing market share in the USA rapidly, and would be replaced shortly by the Model A.
Cinema screen grab from a Czechoslovak comedy film "Prehlídce velim já" made in 1970 where the cars are being investigated by IMCDB. -- This is a cca 1927 Chevrolet Series AA Capitol 2 door Coach. Launched in 1927 just as the Ford Model A was introduced, it sold 679,000 cars, The widow's peak rad was only used for one season. Chevrolet was part of General Motors. GM cars in Europe were assembled in Denmark in 1923 and Belgium in 1925, Vauxhall UK in 1925, and Opel in Germany in 1929. 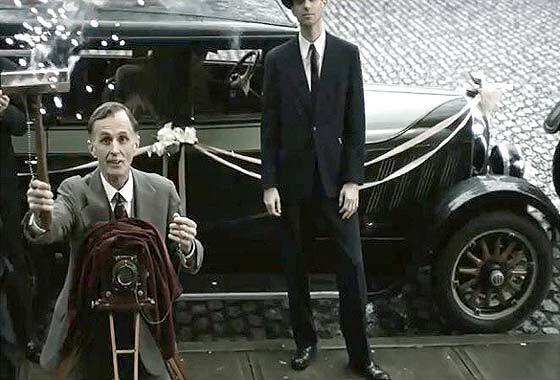 Cinema screen grab from an American yet to be released film "The Age of Adaline" due April 2015 where the cars are being investigated by IMCDB. Film is about a young woman who becomes ageless due to an accident. -- Wrap-over paintwork is distinctive as are the hubs, as are four forward slanting louvers, all suggest a cca 1927 Auburn 6-66. Could be the bigger 8'88 which also has same louvers. 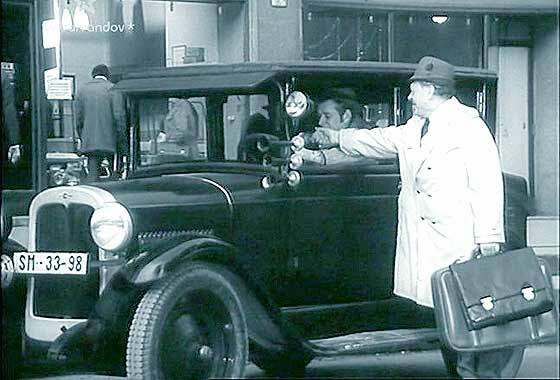 However, the film was shot in Vancouver and same / similar car seen in a Vancouver car show. Number of interesting photos sent to us by Andrew Kostin from Moscow (Russia) who is a collector of old photos and who has a website devoted to this subject at http://antique-photos.com/en/. Can we identify this lovely photo? -- Nazi swastikas on the flags on the front bumper. 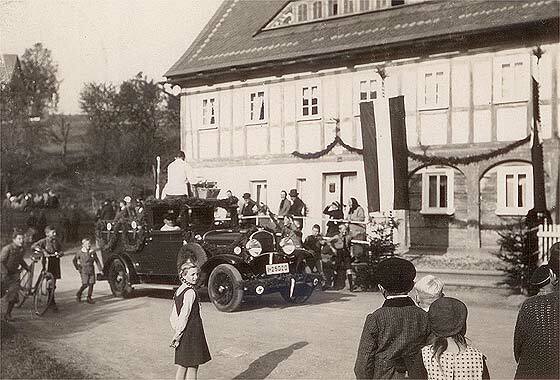 Photo was taken in Seifhennersdorf, Germany, close to the Czech border in September 1935. The vehicle however is from America. This is a cca 1929 Chrysler Model 75 Pickup or van, without the roof over the back. Number of interesting photos sent to us by Andrew Kostin from Moscow (Russia) who is a collector of old photos and who has a website devoted to this subject at http://antique-photos.com/en/. Can we identify this nice photo from Argentina? 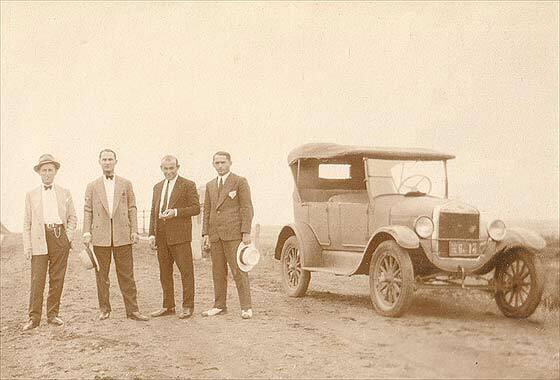 -- Photo is dated August 1929 which would suggest the car is quite new. 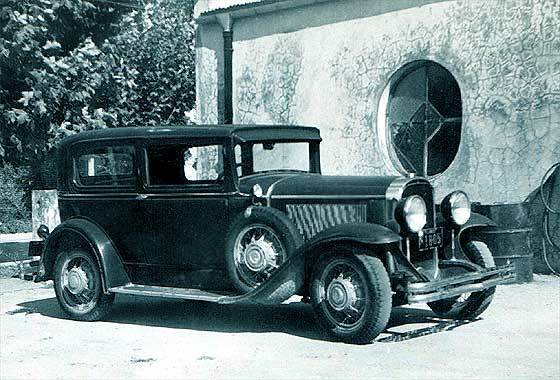 From big headlights and rounded shape of the louvre panel, twelve spoke wheels and four fixing clamps, our Tony Tester corrected this to a cca 1929 Chrysler Model 65 Two-door Sedan. Number of interesting photos sent to us by Andrew Kostin from Moscow (Russia) who is a collector of old photos and who has a website devoted to this subject at http://antique-photos.com/en/. Can we identify this nice photo from Argentina? -- Big car , from America, with two rows of short multiple louvres. Badge on the radiator is a inverted triangle with three rows of writing. This is a cca 1929 Hudson Super Six. Difficult from the photo to say if it is a two seat Roadster or a perhaps Sport Phaeton. Number of interesting photos sent to us by Andrew Kostin from Moscow (Russia) who is a collector of old photos and who has a website devoted to this subject at http://antique-photos.com/en/. Can we identify this photo from Argentina ? 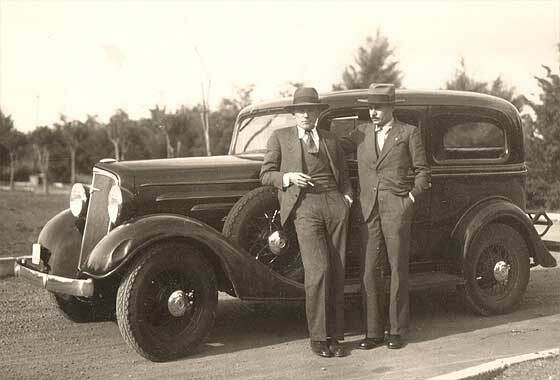 -- American car made by General Motors who started operations in Argentina in 1925 and had the first factory producing "Especial Argentino" in 1929. From the radiator, this is probably an American made car, a cca 1930 Buick Six Two-Door Sedan. Number of interesting photos sent to us by Andrew Kostin from Moscow (Russia) who is a collector of old photos and who has a website devoted to this subject at http://antique-photos.com/en/. Can we identify this nice photo from Argentina? -- Photo required bit of repair. It was entitled 'our yellow and black car'. It is an American cca 1930 Ford Model A Sports Coupe. Model A was the follow-on car to the Model T and was made from December 1927 to March 1932 and 4 million were made. Number of interesting photos sent to us by Andrew Kostin from Moscow (Russia) who is a collector of old photos and who has a website devoted to this subject at http://antique-photos.com/en/. Can we identify this lovely photo?? -- Not much of the car is visible so remained thought German and unidentified until our Tony Oakes spotted that it might be French. German manufacturers had front hinged doors, not suicide. 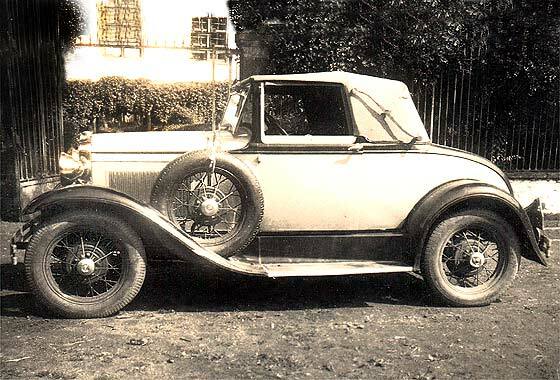 Further research suggests that this is a cca 1931 Peugeot 201 Coupe. Number of interesting photos sent to us by Andrew Kostin from Moscow (Russia) who is a collector of old photos and who has a website devoted to this subject at http://antique-photos.com/en/. Can we identify this blurry photo from Romania? -- Very blurry photo but when cleaned up, lightened and sharpened, it was possible just to make out the badge. This is a cca 1933 Dodge Tour Bus. Dodge made cars so contracted to Graham Brothers to build their Dodge badged bus/commecial vehicles. Number of interesting photos sent to us by Andrew Kostin from Moscow (Russia) who is a collector of old photos and who has a website devoted to this subject at http://antique-photos.com/en/. Can we identify this photo from Argentina ? 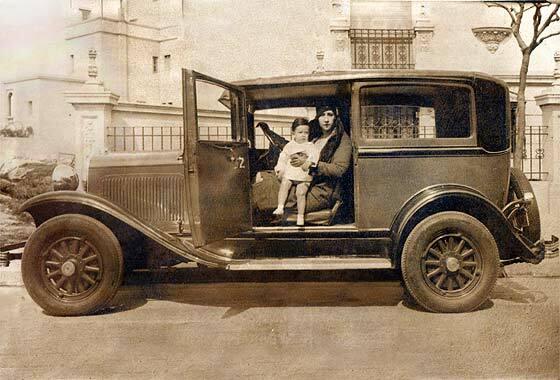 -- American car made by General Motors who started operations in Argentina in 1925 and had the first factory producing "Especial Argentino" in 1929. 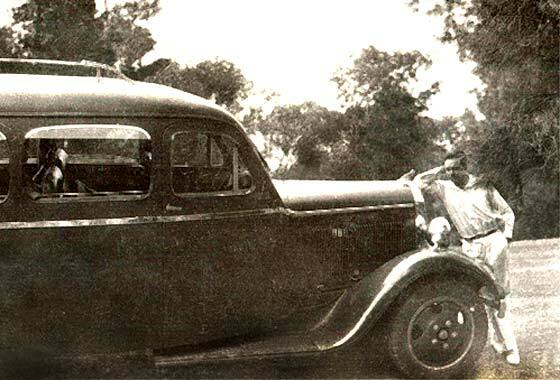 The local company was called 'Chevrolet' so could be a local cca 1934 Chevrolet DA Two-Door Coach. Number of interesting photos sent to us by Andrew Kostin from Moscow (Russia) who is a collector of old photos and who has a website devoted to this subject at http://antique-photos.com/en/. Can we identify this poor photo from Argentina? -- Photo required repair. Immediate recognition feature is the emblem on the top of the radiator which is the 'standard' of United Kingdom. Standards were flags which were used in battles. British cca 1948 Standard Flying Eight Drophead coupe. Number of interesting photos sent to us by Andrew Kostin from Moscow (Russia) who is a collector of old photos and who has a website devoted to this subject at http://antique-photos.com/en/. Can we identify this photo from the state of Pinang in Malaysia ? -- The logo appears to be letter 'T', other cars e had letters 'PC'. The car was built in Japan in the new Motomachi Plant by the company developed from the Toyoda Automatic Loom Works. This is a cca 1962 Toyota Publica UP10 Estate. Number of interesting photos sent to us by Andrew Kostin from Moscow (Russia) who is a collector of old photos and who has a website devoted to this subject at http://antique-photos.com/en/. 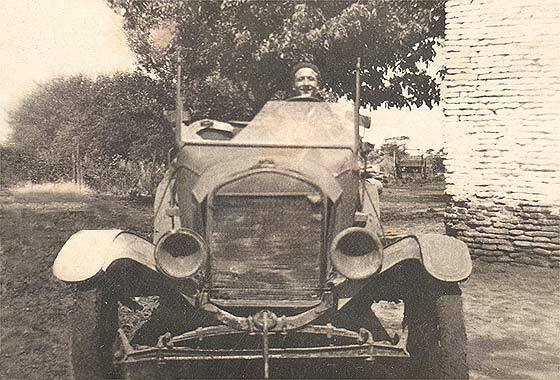 Can we identify the vehicle in this photo from Argentina? -- No positive responses from our experts. Too much of the car is hidden to provide any identification features. Wheels suggest it could be cca 1928 Chevrolet. 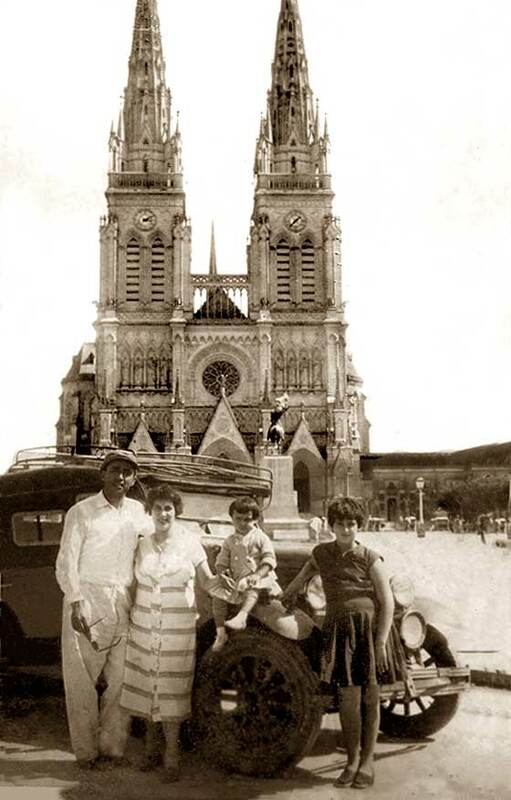 Church in background has been identified as Basilica of Nuestra Señora in Luján. 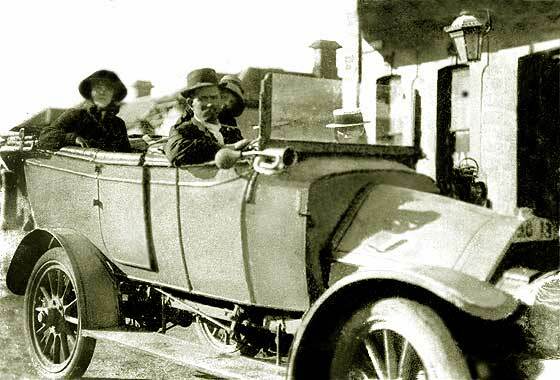 Puzzling photo sent to us by Jo Moran (Australia) of Grandfather who chauffeured from Adelaide to Port Lincoln for a wealthy family. Taken before October 1914, when he went WW1. 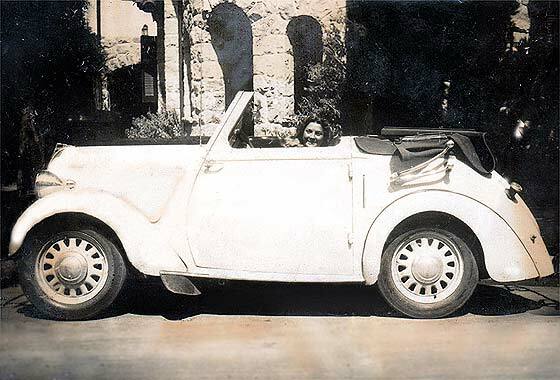 Can we identify car. -- Not identified by any of our experts. 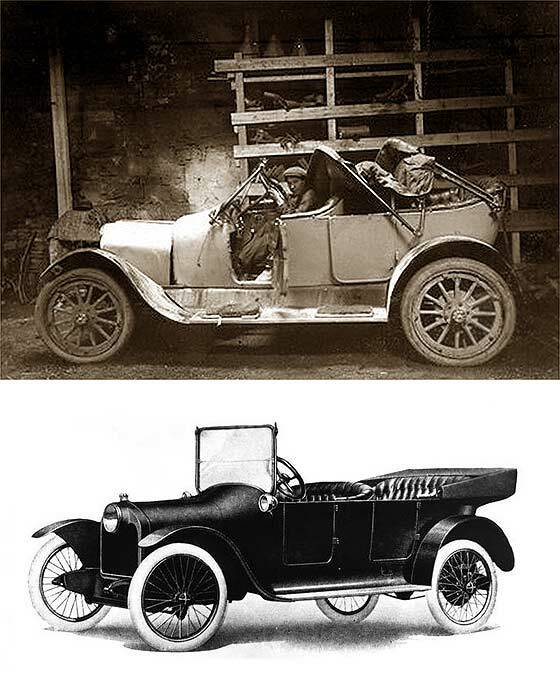 All agree the body seems 'home made' and possibly a re-body of earlier car, shortened chassis; chassis 1908, discarded body 1912, assembled 1913-14. Internal handbrake with external rods. British?? Possible suggestions include cca 1909 Humber.